How to Fix Google AdSense Crawler Errors by Google Webmaster Tools Dear friends few day ago i post on top paying keyword of Google adsense now i share an awesome tips how to remove Google AdSense Crawler Errors by Google Webmaster Tools easily.Just you have to do small task. Dear friends few day ago i post on top paying keyword of Google adsense now i share an awesome tips how to remove Google AdSense Crawler Errors by Google Webmaster Tools easily.Just you have to do small task. 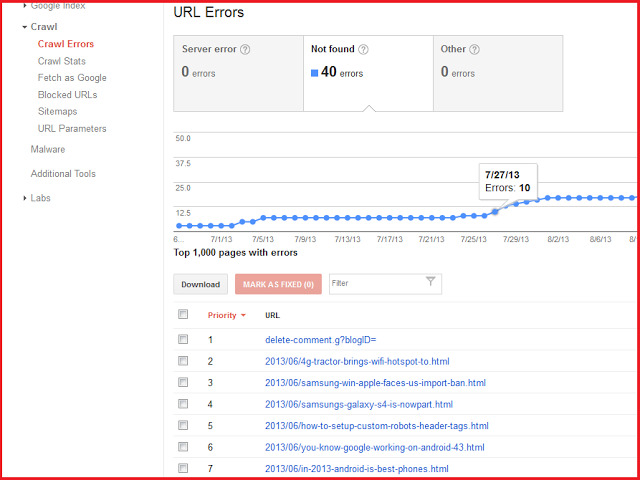 01.Go to the Google Webmaster Tools Site Dashboard. 02.Now click on Crawl and next click drop down menu Crawl Errors. 05.Now Click on Mark As Fixed. Finally your Crawler Errors problem solved. Thanks for stay with us..